Following the launch of Schodt's much anticipated "Darkness | Light" artist album, our latest Silk Royal single showcases two stunning new interpretations of the album's lead single, "April". Johan Vilborg, now one of the most internationally supported talents on our imprint, has been tapped for the first of two new renderings, the second of which is from Schodt himself. Known for ebullient peak-hour progressive trance, Johan delivers one of his most uplifting cuts to date. The track begins with the most distinctive hook from the original: a hypnotic series of female vocal stabs. Soon thereafter, we are met by an extremely funky, layered bassline progression; the mid-range pad layers are slowly filtered into the mix and then finally hit with full force at the quarter turn. In the mean break, a poignant piano theme is added to the affair, while the gorgeous vocals dance overhead. The drop to follow packs an enormous, stadium-rocking punch. 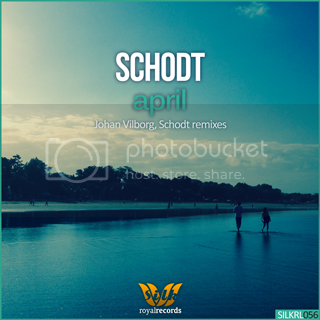 Schodt offers an exceedingly beautiful rework; veteran fans of his music will not be surprised by the chillout/downtempo direction he has chosen, as he has written numerous tracks in this style in his near decade-long career. A soothing and deeply heartfelt keyboard theme is introduced early, as a variety of early 'morning' nature effects enhance the soundscape. A light rhythm and a "flock" of swirling trance-influenced arp lines slowly begin to crescendo, as sweeping string themes take center stage. The cinematic orchestration, especially in the climactic second half of this one, will leave you breathless.